The term noosphere derives from the Greek νοῦς (nous “mind”) and σφαῖρα (sphaira “sphere”), and is related to the terms geosphere (inanimate matter) and biosphere (biological life). Under Teilhard’s vision, God created the Big Bang, which created an evolutionary process starting with the energy of the Big Bang leading to increasing “complexification” to matter, to initial life forms, to human consciousness, to a collective human consciousness (the noophere). 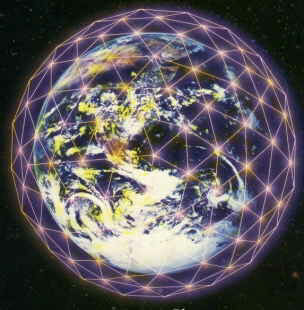 The noosphere emerges through and is constituted by the interaction of human minds. The noosphere has grown in step with the organization of the human mass in relation to itself as it populates the Earth. As humanity organizes itself in more complex social networks, the higher the noosphere will grow in awareness. Teilhard argued the noosphere is growing towards an even greater integration and unification, culminating in the Omega Point (or the Cosmic Christ, the second person of the Trinity). Ever since the Big Bang, our universe has gradually grown in complexity. From an initial point of intensely concentrated and homogeneous matter, we see the formation and evolution of stars, galaxies, and planets as the primordial ball of plasma expanded, cooled, and formed structures of ever-increasing complexity. In the case of Earth, we also see the development of biological life with its even more complex forms of matter. These organic structures are actually containers of sorts-densely packed with information. The more information an object carries in a given volume, the more complex it is. A strand of DNA is not only smaller than a grain of sand, it is also considerably more complex because it contains more information than the silicon in the grain of sand. Teihard de Chardin first used the term noosphere in approximately 1927, but the intellectual concept was first developed during Teilhard’s service in the trenches of World War I. The atmosphere of ‘the Front’: it was, I am quite sure, from having plunged into that atmosphere—from having been soaked in it for months and months on end—and precisely where it was at its most dense and heavily charged, that I ceased to notice any break (if not any difference) between ‘physical’ and ‘moral’, between natural’ and ‘artificial’. The ‘Human-million’, with its psychic temperature and its internal energy, became for me a magnitude as evolutionary, and therefore as biologically, real as a giant molecule of protein. I was later to be astonished on many occasions to find in my own circle that those who could not agree with me suffered from a complete inability to understand that precisely because the individual human being represents a corpuscular magnitude he must be subject to the same development as every other species of corpuscles in the World: that means that he must coalesce into physical relationships and groupings that belong to a higher order than his. It is, of course, quite impossible for him to apprehend these groupings directly as such . . . but there are many indications that enable him to recognize perfectly well their existence and the influences they exercise. . . I have no doubt at all (as I said earlier) that it was the experience of the War that brought me this awareness and developed it in me as a sixth sense. Teilhard de Chardin, Pierre (1980-07-23). Heart Of Matter (Kindle Locations 412-419). Houghton Mifflin Harcourt. Kindle Edition. “[H]ow can we fail to see that the process of convergence from which we emerged, body and soul, is continuing to envelop us more closely than ever, to grip us, in the form of—under the folds of, we might say—a gigantic planetary contraction? Teilhard de Chardin, Pierre (1980-07-23). Heart Of Matter (Kindle Locations 499-510). Houghton Mifflin Harcourt. Kindle Edition. In Part II, we will examine how Christianity understands the spiritual Noosphere. This entry was posted in Uncategorized and tagged Big Bang, biosphere, complexity, evolution, geosphere, Noosphere, teilhard de chardin. Bookmark the permalink. Thank you again for all that you offer us here. Ooo, love Teilhard’s noosphere concept – as that is what exists right now. The mind sphere within all things, surrounding all things, and as all things – not the least of which is the internet. Looking forward to the next two parts. And the Omega Point is the point where I – that is, the entire Universe of people and things that I am unify in Me. An interesting concept, that, as I am already One to begin with. Quite the Paradox I am. Humanity is a paradox! Yes, I am very intrigued by the concept of the noosphere (hence one of the reasons for my fascinating with Teilhard de Chardin). We truly live in an interesting time. I am glad you enjoy. I largely agree with your summary that there is a primary source of consciousness that inhibits all living organisms but during this lifetime are limited by their current forms. Christians believe that this source stems from the Creator, but yet is different from the Creator, similar to a ray of sunshine is different than the sun. I believe Teilhard de Chardin lays it out well in that there is an evolutionary progression from simple to complex and at various points there are significant evolutionary leaps. For example, the first spiritual humans (which may be distinct from the first genetic homo sapiens) were likely created ~50,000 – 100,000 years ago and crossed a significant ontological barrier from its predecessors. Similarly, humanity is continuing to evolve (individually and collectively) towards an Omega Point, which Christians call God. Really worth the read ! Well written and thoroughly enjoyable. In my vision the entire sky was a shimmering color of lavender which was pulsing, each pulse grew with intensity (I sensed it was like a blanket), what even more fascinating was that there were these seemingly pulsing points of light which were set in a grid like pattern, from my minds perspective these points of light were pulsing not in rhythm with the other but in a opposing rhythm. Then something very curious started to happen. These points of lights started falling from the heavens and as they fell, they turned into different symbols that I came to understand were the different native American Indian tribes. When they landed on the ground they began to praise the heavens and the pulsing grew at a more rapid pace. It was here my vision ended. I’m convinced now what I saw was the noosphere. Thank you for bringing enlightenment to something that has always perplexed me. Thank you so much for stopping by and for sharing your experience. I am also glad to have found your wonderful blog which I look forward to following. You know I am of the opinion he is correct.